Historic Rabbinic Ban: It Is Prohibited to Vote for Pro-Homosexual Politians | RabbiLevin.com - Fighting for Morality! 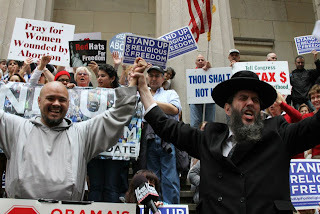 Sunday May 24th, 2009 , an Emergency Conclave of the "Rabbinical Alliance of America" banned voting, supporting or honoring any politicians who support the homosexual agenda. Spokesman Rabbi Yehuda Levin appealed to Jewish Orthodox organizations, Agudath Israel, OU, etc., to join in the ban. Similarly, the Rabbis of appealed to Christian denominations such as: "The Southern Baptist Convention", "The National Catholic Conference of Bishops" and Pope Benedict to issue similar bans. Thank you so much for your G-dly words. I'm a Catholic and I agree we need to all stand together on these grave moral issues. You will be pleased to know that a Catholic document opposing legal recognition for homosexual relationships already exists. "...all Catholics are obliged to oppose the legal recognition of homosexual unions..."
I just looked at this website, and saw a video about the Rabbinic Ban prohibiting voting for pro-homosexual politicians. I have no doubt they represent a small minority of Jews. This demonstrates disrespect for democracy, and demonstrates the same types of hatred exhibited by a minority of certain Christian and Muslim groups. Why can't these people allow minorities to live in ways that make them happy and fulfilled; they harm no-one. Religious people who believe that homosexuality is sinful, are free to apply that belief to themselves; they should leave others alone, and not try to impose their beliefs on them. He's even blamed the closure of a Jewish school because of Swine Flu on this. I hope there are people in the USA brave enough to resist this type of malignant superstition and hatred. May the Lord be praised for your bold words at the pro-life march. My husband and I are evangelical Christians who love Israel. You spoke as a prophet, fully of His spirit. May America repent and stop the murders of innocent children! We, too, fear what may befall our country if we continue in sin. Blessing upon you.